At Arnold Hearing Centres in Guelph, Simcoe, Mount Forest and Kitchener-Waterloo, we consider the comfort and care of our patients first and foremost. We'll walk you through your first visit, every step of the way and explain your results at the end. A typical first visit to Arnold Hearing Centres will take approximately an hour to an hour and a half. We suggest bringing a companion with you as its helpful to have a voice you recognize with you. Below is an outline of a common first visit to Arnold Hearing Centres. We'll ask you to come in about 15 minutes early to fill out a case history. This helps provide a background of your hearing health and concerns before starting the hearing test. Your clinician will then review the case history and bring up any pertinent questions. We first do a visual exam of the ear canal and ear drum with an instrument called an otoscope. We use it to check the condition of your ear canal and ear drum, if there’s too much ear wax and/or any abnormalities or ‘red flags' that could cause unreliable results in your hearing test. Then we use a test called 'Tympanometry' to gauge the condition of the middle ear and the mobility of the eardrum. This is done by releasing a small burst of air into the ear canal and the Tympanometer then reads out the results to give us an idea of the health of your ear drum. We then perform a test called Word Recognition that gauges your ability to discriminate single syllable words from a phonetically balanced word list, resulting in an easily measurable percentage score indicating your ability to discern conversation. We record the average faintest speech you can hear, allowing us to know how audible conversations are to you. It also helps us to find out what volume of sound you can tolerate and how quiet words can be before you can no longer distinguish them. Finally, we do a hearing test via headphones and bone conduction to determine the faintest tones a person can hear at selected frequencies, from low to high. 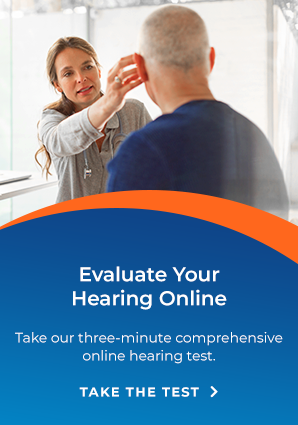 The results help determine your abilities and what type of possible hearing loss you may have. All parts of the hearing test are explained to you in an easy to understand manner. Based on those results we would then discuss what options we recommend. You are under no obligation to purchase, we are here to present your results and our recommendations.